Friday, Sunday and Monday: 9 p.m. to 5 a.m. Saturday: 9:30 p.m. to 5 a.m. Dress to impress: No torn ot cut-off clothing or athletic wear allowed. Proper pool footware including sole. No European bathing. Cabanas, tables, couches, Lounge chairs or daybeds. 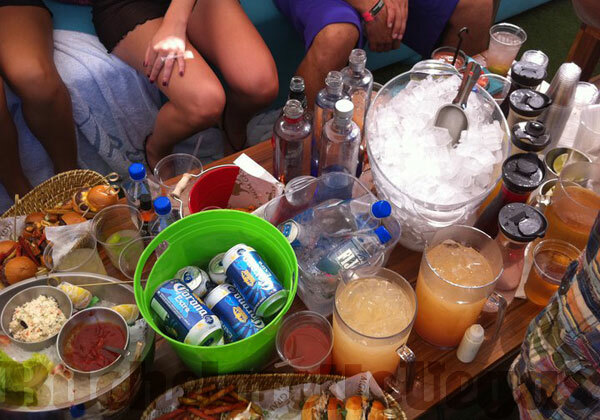 When it's hot in Las Vegas, Wet Republic at the MGM Grand is the place to go. This adults only playground has seen its share of celebrities and partiers – bronzed men and women who can't wait to party in the sun with like-minded individuals. 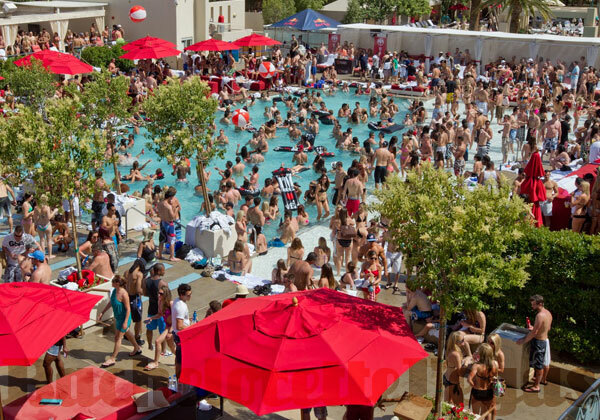 Wet Republic Ultra Pool opens during the warm months of the year. 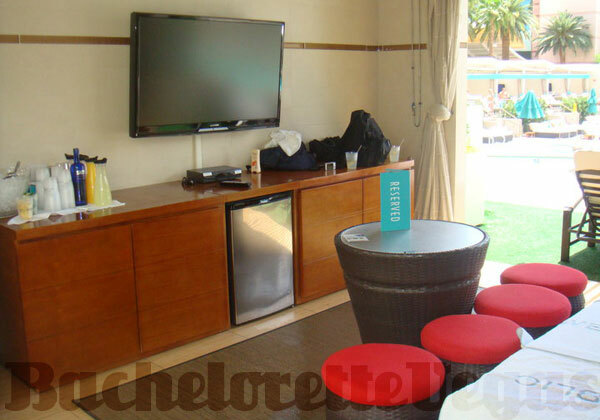 This resort is the ideal location for a bachelorette party or any girl-related get-together. If you're looking for a Vegas hot spot to plan your party, Wet Republic at the MGM Grand is the ultimate party experience. The space occupies 53,000-square-feet and every inch is dedicated to Wet Republic's individual vibe. Blue, white, and other crisp colors can be found in the décor, as well as on the servers (who are all models by the way). One unique feature of Wet Republic is the two large saltwater pools – a first in Las Vegas. Together, the pools cover more than 6,000-square-feet. Don't forget about the 2,500-square-foot open lounge where guests can enjoy the music and atmosphere. Running from the length of the main pools is a bar area. Guests can enjoy frozen drinks and cocktails – or the pitcher service of delicious, summer beverages. If you enjoy being in the pool, take a brief walk over to one of eighteen lounges scattered throughout the shallow end. If you'd rather stay out of the water, lay back in one of eighty chaise lounges and have the drinks come to you. There are eighteen daybeds available throughout the venue, as well as ten party cabanas. These are perfect for any bachelorette party or a day out with the girls. Wet Republic also has VIP bungalows which come with reserved chaise lounges, a refrigerator, a flat screen television, an X Box 360, and a private spa area and bathroom shared with other bungalows. The bungalows also have their own Jacuzzi and personal security safe for storing your valuables. If you want to be the center of the party, the Dance Floor Tables are where you'll want to be. Guests can receive all of the luxury of the Web Republic VIP Experience with a position next to the main pool and dance floor. VIP guests will also enjoy a comfortable banquette that features a large umbrella to shield you and up to ten of your party guests from the hot sun. Be sure to call and make reservations if a Dance Floor Table is up your alley. When you get hungry from all your pool partying, there are plenty of delectable items from Wet Republic's dedicated kitchen. Guests can enjoy burgers, wraps, and a wide variety of eccentric deserts. 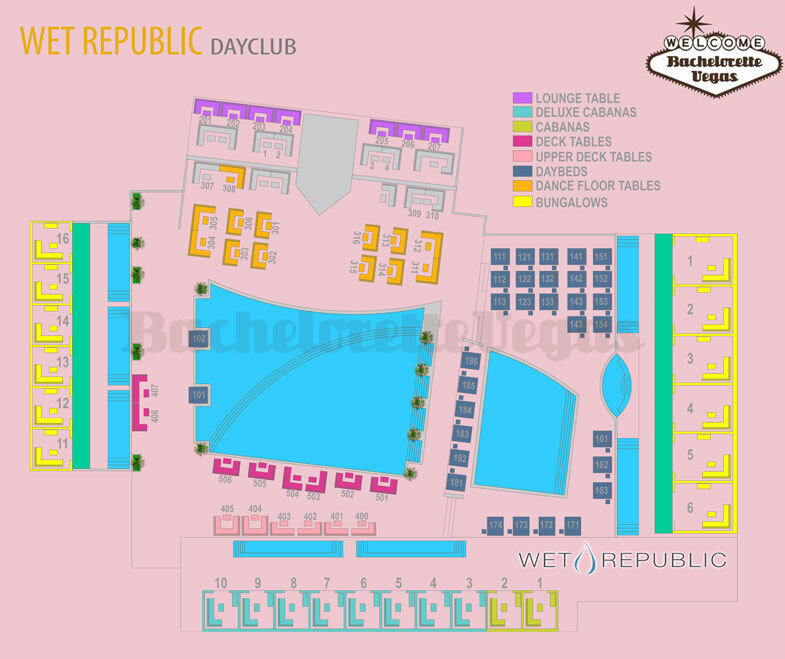 Wet Republic is also spacious, allowing plenty of room to host big name entertainers. Don't forget the top-notch DJs that will spin for pool guests. As you plan your bachelorette party or other event, don't forget about one of the best pool party spots on The Strip. Wet Republic at the MGM Grand is like no other with its unique style, VIP amenities, and all the things you'd ever want from a dayclub.